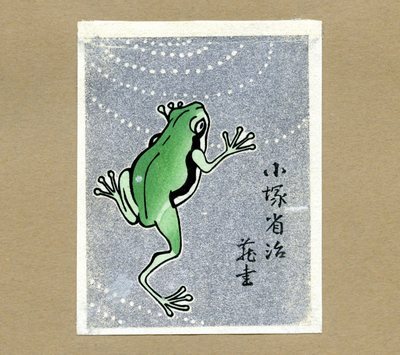 Woodblock bookplate printed from six blocks of various colors.The image depicts the frog of Onono Dofu, from a famous Japanese story. Text in Japanese. Affixed on cardstock paper. Removed from duplicate set. Shoji Kozuka, President of the Nippon Zoshohyo Kyokai (Japanese Bookplate Society) and painter of toys. Images provided for research and reference use only. For more information please contact the University Archives/ Special Collections Department, Copley Library, University of San Diego. "K. Kawasaki Bookplate" (1967). Japanese Bookplate Collection. Image 78.